March 1 – 30, 2019 DRIP, DRIBBLE, SPLASH: Works Inspired By Abstraction Juried Exhibition. 427 E. Colorado Ave., Colorado Springs CO.
2018’s Pikes Peak Arts Council Member Show, at the Ivywild School, with an opening reception First Friday, December 7th from 5:00 – 8:00 p.m. in conjunction with the PPAC Winter Member Mixer. Show runs through December 28th. My painting, “Breaking Surface #17,” 30 x 30, encaustic on panel, hangs inside Bristol Brewing Company. Breaking Surface #17, encausitc, 30x 30. Featured Artist with Nard Claar, 45 Degree Gallery, Old Colorado City, Colorado. , 5 – 8p. Another one of our Two Person Painting Shows and Demos! Encaustic Demo by Sheary, Mixed Media Demo by Nard! “Separate But Equal?” Encaustic and Mixed Media, 12 x 12 x 2.5. Presented by Cottonwood Center for the Arts at Cottonwood Center for the Arts, 427 E. Colorado Ave., Colorado Springs CO. A juried show based off the inspiration of Helen Frankenthaler’s work. Exhibit runs through December 4, 2018. “Interiors,” Encaustic, 24 x 12. Exhibit runs November 2nd-29th, 2018. ‘Slot Canyon,” Encaustic, 18 x 12. SOLD! DENVER! Through November 18, 2018. Click Here for a list of all the invited artists and more details about ASLD! “Reparation,” encaustic, 30 x 30. FRIDAY, OCTOBER 5, 5 – 7p. Manitou Springs. Show runs through Saturday, November 10, 2018. The Manitou Art Center’s Annual “Best of Members” show! “Amplitude,” encaustic, 36 x 18, diptych. TUESDAY, OCTOBER 16, 5 – 8p in COLORADO SPRINGS! at the Colorado Springs Fine Arts Center at Colorado College. 2018 PPAC “Established Artist” category. Lance Green, Abigail Kreuser, and myself. UPDATE: Congrats to Abby for the well deserved award! MACnificent is the annual gala and fundraiser for the Manitou Art Center. This year the MAC celebrates 30 years of artistic passion with a PechaKucha night of fast-paced presentations. The evening will include delectable hors d’oeuvres, a silent auction, live music, and commemorative posters for sale! Nard and I will be there and we both have paintings in the silent auction! Tickets here. “Within,” encaustic, 12 x 12. SOLD! Pikes Peak Studio Tour, Colorado Springs, Colorado. October 20 & 21, 2018. Three Artist Invitational Exhibition, Niza Knoll Gallery, Denver, Colorado. August 3 – Sept 1, 2018. As part of their winnings, these three artists were awarded a future three person show at Niza Knoll Gallery. Well, fans, this is it! WAX STORIES 2: THREE WINNERS! Opening Reception: August 3, 4 – 8p. Artist Reception: August 17, 4 – 8p. Come say hello, Nard and I will be there! Exhibition runs through September 1, 2018. UPDATE: A painting from this show that found its new home! Thank you, Niza Knoll Gallery. “CROSSFIRE,” Encaustic on panel, 30 x 30. SOLD. “Painting With Encaustic” One Day Workshops, Colorado Springs Fine Art Center’s Bemis School of Art, at Colorado College, August 11 and/or 12, 2018. Thank you to all attendees! It was so much fun sharing my passion for painting with encaustic! Solo Exhibition, Stephan Fine Arts Gallery, Anchorage, Alaska. June 1, 2018. Thank you to all who came out for the opening of my show! It was so brilliant to re-connect with my Alaska cohorts! I miss you all! UPDATE: A few of the paintings from this show that found their new homes. Thank you Stephan Fine Arts! “Quilted Lives 2,” Encaustic, 24 x 24 (triptych). SOLD! Stand 4 Revisited, 24 x 12, encaustic. SOLD. The Storm, 8 x 8, encaustic. SOLD. BREAKING SURFACE 3, Encaustic on Paper, 5.25 x 5.25, 10 x 10 matted. “Colorado Originals” from the Colorado Springs Fine Arts Center’s Museum Shop. Presenting a new series of small original encaustic paintings on heavy archival watercolor paper. Starting at just $65, the paintings are already matted and presented in clear sleeve – just add a bow and you’re ready to go! Located in Denver’s Santa Fe Art District. Gallery’s regular business hours are Wednesday-Fridays, 1-5 pm (First and Third Friday 4-8), Saturday 1-4. “FREEFALL,” Encaustic on panel, 30 x 30. Third Place Award! As part of the award, I will be featured with the other two award winners in an exhibition at Niza Knoll Gallery, August 2018. SOLD. “EXPLORATIONS IN ENCAUSTIC,” Solo Exhibition, Deco Lounge, Colorado Springs Fine Arts Center at Colorado College. December 1, 2017 – January 28, 2018. First Friday Art Party/Artist Reception: December 1, 2017 and January 5, 2018, 5 – 7:30p. “CROSSFIRE,” Encaustic on panel, 30 x 30. Closing Party, Sunday October 1, 2017, 3 – 5p. Poor Richards Bookstore/Rico’s Cafe and Wine Bar, downtown Colorado Springs, 320 – 324 1/2 N. Tejon St.
Colorado Springs Art Guild, Encaustic Demonstration, 6p, Tuesday, Sept 26, 2017. Gold Hill Mesa Community Center. Free and open to the public. MACnificent, Manitou Art Center annual event. Septemer 16th, 5:30p. Nard and I each have paintings in the Silent Auction Fundraiser. Best of Members Show, Hagnauer Gallery, Manitou Art Center, Third Friday Opening Reception, September 15, 5 – 8p. Featured Artist with Nard Claar, July, Aug, Sept 2017. Poor Richards Bookstore/Rico’s Cafe and Wine Bar, downtown Colorado Springs, 320 – 324 1/2 N. Tejon St. Featured Artist with Nard Claar, 45 Degree Gallery, Colorado Springs, CO, August 2017. First Friday Art Walk, Artist Reception, Aug 4th, 5 – 8p, in historic Old Colorado City. Located at 2528 B W Colorado Ave, Colorado Springs, CO 80904. 719-434-1214. Free demonstrations: Painting with Encaustic by Sheary Clough Suiter and Painting with Watercolor by Nard Claar. Colorado Springs Fine Art Center at Colorado College, Annual Gala, Saturday, August 26, 2017.. Nard and I each have a painting in the Silent Auction. Image: “ROOSTING,” Encaustic and Mixed Media, 10 x 8. Have you ever been to La Veta, Colorado? I hadn’t, not until I received an invitation to drive south a couple hours to visit La Veta Gallery on Main. Now, I’m inviting you! La Veta Gallery on Main invites artists from all around Colorado to participate in their featured artists program. Friday, June 23, 2017, from 5 – 7p, the gallery will host a Featured Artist Reception for Nancy Utterback and myself. Nancy’s salt fired ceramics are not your usual pots. And of course, there’s nothing “usual” about my encaustic paintings. Nancy and I will each talk briefly about our work. And there will be concurrent art exhibitions up and down Main Street. If you can’t make it to the opening, we’ll miss you, but keep in mind, the artwork will remain on display through July 24th. 210 S. Main Street, La Veta, CO.
Friday, June 23rd, 2017, 5 – 7p. SAIL AWAY, Encaustic, 20 x 24. Available at Attic Gallery, Camas, Washington. Featured Artist and Encaustic Painting Demonstration, First Friday Artist Reception, May 5th, 2017, 5 – 8p. The Attic Gallery New Location: 421 NE Cedar Street Camas, WA 98607. GALLERY HOURS: Tuesday through Saturday, 11 to 5:00 pm. 360.833.9747 or 503.228.7830. Live music, wine, food, fun! Above Image: “PORTALS,” Encaustic and Mixed Media, 20 x 24. One of three encaustic paintings I have on display at this juried exhibition. Where: The Bemis School of Art Gallery in the Colorado Springs Fine Art Center. What: Watercolor, Acrylic, Encaustic, Oil Paintings. The Bemis School of Art Gallery is located the furthest back and left side of the building from the main museum entrance. You can go straight through the Gift Shop and Up the stairway. The gallery will be on your left. URBAN RED, encaustic and mixed media, 24 x 32. Available at 45 Degree Gallery December First Friday Art Walk. SOLD! 45 Degree Gallery FEATURED ARTIST with Nard Claar, December 2nd, First Friday Art Walk, Artist Reception, 5 – 8p, in historic Old Colorado City. Located at 2528 B W Colorado Ave,Colorado Springs, CO 80904. 719-434-1214. Free demonstrations: Painting with Encaustic by Sheary Clough Suiter and Painting with Watercolor by Nard Claar. Encaustic and Mixed Media on Panel, 24 X 42. Available at the PPAC Members’ Juried Exhibition, Cottonwood Center for the Arts. Cottonwood Center For the Arts, Pikes Peak Art Council Members Juried Exhibition: Opening Reception, December 2nd, 5 – 8p. 427 E. Colorado Avenue, Colorado Springs. Image: “Old Growth,” Encaustic and Mixed Media, 24 x 24. The Bemis School of Art Gallery is located the furthest back and left side of the building from the main museum entrance. Artisan Materials Expo 2016. This year, the expo is joined by International Encaustic Artists and Encaustic Art Institute to bring you a power house of art workshops and vendors offering products at discounts. I’ll be shopping for art supplies and attending workshops to enhance my own teaching skills and knowledge. September 29 – October 2, 2016, Buffalo Thunder Resort and Casino (10 minutes north of Santa Fe, New Mexico). Artisan has sponsored and held these gatherings in Santa Fe since 2000. There will be 60 booths, 99 workshops, and ongoing Free Demos. It will again be held at Buffalo Thunder Resort, 10 minutes north of Santa Fe, New Mexico. The 2016 Expo is held concurrently with the 2016 International Balloon Festival in Albuquerque, Sept 30 – Oct 9. This will allow you to head on down to Albuquerque after the Expo for balloon fiesta enjoyment! 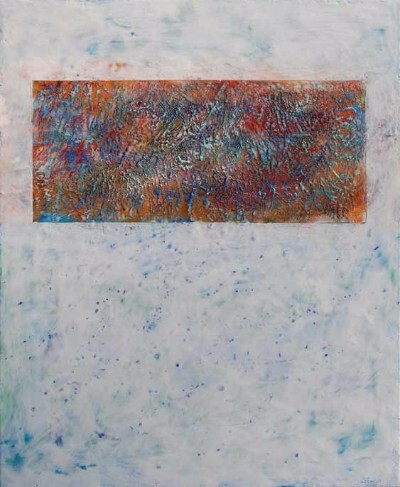 Above Image: “CONSIDERATIONS,” Encaustic and Mixed Media, 20 x 20 x 1.75. Will be available October 2016 at Stephan Fine Arts Gallery SOLO EXHIBITION, New Encaustic Fine Art. First Friday Artist Reception, October 7, 2016, 5:30 – 10p. Show runs through October 20th. Located downtown inside Hotel Captain Cook, 939 West 5th Ave. Anchorage, Alaska 99501. (907)274-5009. Gallery Hours: Sun-Mon 10-7 | Tues-Sat 10-10. Preview the new collection online. Click on one of the 19 images for a slide show with titles and dimensions of each painting. You can zoom in to each image. “Late and Soon,” Encaustic and mixed media, 16 x 20. Tickets: $30 for PPAC Members, (use discount code: PPAC2016), $40 for Non-members. Tickets include general admission, appetizers, and 1 soda, wine, or beer. The Pikes Peak Arts Council (PPAC) presents these awards to honor those individuals who have made extraordinary contributions to the cultural life of the Pikes Peak Region. And the Aventa Credit Union “Spirit of the Arts” Award celebrates the special volunteers who give time and energy behind the arts scene, but who rarely receive public recognition. I’m honored to have been commissioned by Aventa Credit Union to create an original encaustic painting specifically for this award. Thank you, Aventa Credit Union, for creating this award and for celebrating arts volunteerism!!! Where: The Cliff House at Pikes Peak in Manitou Springs! Why: All proceeds for this event support the Manitou Art Center and their mission of creating an environment in which artists, tinkerers, collaborators and you can flourish in our community. This unique affair includes a live and silent auction of amazing art from well-known local artists, live music and entertainment, delectable hors d’oeuvres, a cash bar with wine, beer, and cocktails, and special guests of honor Kat Tudor and David Siegel. Above Image: “STRATEGIC EXIT,” Encaustic, 30 x 24, on display at the Manitou Art Center Member’s Show. August and September, 2016. Catch this show and others currently hanging at the MAC. 513 Manitou Avenue, Manitou Springs, Colorado. Summer Hours: 8am–8pm Monday-Friday, 8am -5pm Saturday, 11am-5pm Sunday. Phone 719-685-1861. Above Image: “MY INNER CHILD,” Encaustic and Mixed Media, 12 x 12 x 1.75, Available at Cottonwood Center For the Arts, Juried Exhibition: “An Examined Life – Self Portraits,” August 27 – September 17, 2016. Opening Reception, August 27th, 6 – 9p. 427 E. Colorado Avenue, Colorado Springs. Exhibition Dates: September 1 – October 28, 2016. 304 Hwy 105, Palmer Lake, Colorado. Featuring nine Colorado artists responding to and working with nature as subject matter, media, and/or theme. This is a huge venue, each artist contributed 5 paintings, it is a not to be missed exhibition of local artists! Invited artists: Stan Baldwin, Laura BenAmots, Nard Claar, Juel Grant, Audrey Gray, Abigail Kreuser, Rik Sargent, Kevin Matthew Siemers, and Sheary Clough Suiter. Juried Photography Exhibition (vision, interpretation and use of monochromatic LIGHT) Audrey Gray, Abigail Kreuser, Rik Sargent, Kevin Matthew Siemers, and Sheary Clough Suiter. It’s a party! Join Nard and me to celebrate the closing of my three month summer exhibition of encaustic paintings at Poor Richards Bookstore/Rico’s Cafe and Wine Bar. Art, wine, beer, and fun company! Take your favorite painting home with you for a bargain price!!!! (Yes!…. a one-day-only discount on all remaining artwork). Sunday, August 28 at 5 PM – 7 PM. Rico’s Café and Wine Bar. Poor Richard’s, downtown Colorado Springs, 320 – 324 1/2 N. Tejon St. Free parking in downtown on Sundays! Details on facebook….even if you can just stop by to say hi and look at the artwork! Would love to see you. “Quilted Lives No. 2.” Encaustic, 24 x 24. Above Image: “Rampart Reservoir,” Encaustic, 12 x 12. This painting is my donation piece for the Colorado Springs Fine Arts Center’s Season-Opening Gala, “Rio Carnival” Silent Auction. Tickets available now for the August 27th black-tie event of the season! Dingle Peninsula, County Kerry, Ireland. Rico’s Café and Wine Bar. (Poor Richard’s, downtown Colorado Springs, 320 – 324 1/2 N. Tejon St.). I’m honored to announce I am the featured artist at this fine venue during the months of June, July, and August, 2016. Artist closing reception August 28, 2016, 5 – 7p. Evening Mesa, encaustic and mixed media, 24 x 42 (diptych). 45 Degree Gallery, Old Colorado City: Saturday, July 2, 2016. Registration is open! Bemis School of Art‘s Summer 2016 Printed Catalogs have been delivered to your mail boxes, or call 719.475.2444 to register by phone. SOLD OUT, WAIT LIST ONLY: Painting With Encaustic Course #A-89: One Day Workshop “Painting With Encaustic.” Saturday, June 25, 9a – 3p. (an additional hour added to the class!). Course fee: $130 ($120 Members) + $20 materials fee. This is the only summer class I’ll offer for beginning encaustic, so register asap as I guarantee the class limited to 8 will be full! SPACE AVAILABLE SUNDAY MORNING ONLY: You’ve asked for it, and now you can have it! Designed for students who have taken at least one of my “Painting With Encaustic” workshops, “Encaustic Open Studio” sessions provide you with everything you need to further develop your encaustic painting experience while enjoying the instructor’s guidance and the camaraderie of other encaustic enthusiasts. You’ll enjoy a solid three hours of encaustic painting time without the hassle of setting up your own studio or the interruptions of newbie instructions. The $15 materials fee per session includes all the paints, supports, and mixed media materials, plus you are welcome to bring along your previous encaustic paintings for further development. You may register for one or both sessions. Encaustic Open Studio Session One: Sunday, June 26, 9a – noon. Course fee: $55 ($45 Members) + $15 materials fee. Encaustic Open Studio Session Two: Sunday, June 26, 1p – 4p. Course fee: $55 ($45 Members) + $15 materials fee. JOIN our local gallery, 45 DEGREE GALLERY and attend the 2016 Taste of Old Colorado City, Sunday May 1st, 1 – 4p. Tickets here. I’m going to IRELAND! Nard and I have been awarded an artist residency at Olive Stack Gallery, in Listowel, Ireland, for the month of March 2016. We will paint, man the gallery, hold workshops, connect with the local community! Thank you, Olive! Olive Stack Gallery, Listowel, Kerry County, Ireland. ENCAUSTIC WORKSHOPS: Bemis School of Art’s Winter/Spring 2016 Catalogs is now available in hard copy and online. Register right away for the January classes. Yes! You may sign up for both days for maximum exposure: Colorado Springs Fine Arts Center Bemis School of Art. “Painting With Encaustic.” 10a – 3p, Saturday, January 30 and/or Sunday January 31, 2016: Suitable for beginning and intermediate level. Register online or call the Bemis office at 719.475.2444. I’m honored to learn from friends in Anchorage that my encaustic painting “Deshka Camp” was selected for inclusion in the current Anchorage Museum exhibition “LIVING ALASKA: A DECADE OF COLLECTING CONTEMPORARY ART FOR ALASKA MUSEUMS” Exhibition runs through February 7, 2016. “ROAD TRIPS.” Two person show with Nard Claar at Soirée Event Center, (719) 633-8313, 1003 South Tejon Street, Colorado Springs, CO 80903. Aperaçu Reception: Saturday, October 10, 2015 from 5:00 pm to 8:00 pm. Wrap It Up Celebration: Sunday, December 20, 2015 from 2:00 pm to 5:00 pm. You may bring your un-wrapped Holiday gifts and enjoy artful wrapping materials, hot chocolate bar, and more……this will be the show closing event, as well. “Without Knowing,” Encaustic, 20 x 24. Available at 45 Degree Gallery, Old Colorado City. Friday, November 20th, 5 – 8p, during Manitou Springs’ Third Friday Artwalk, I will be at the Manitou Art Center‘s lovely Hagnauer Gallery as one of seven artists in the First Annual Best of Members’ Gallery Exhibit, 513 Manitou Ave. On display will be three of my multipanel encaustic paintings from the “Architextural Abstractions” series. Exhibition runs through January 10, 2016. Also featuring:Marianne Flenniken, Craig Cantrell, Kathleen Fowler, Wanda Veltkamp, Rhonda Van Pelt and Gary Snyder. Hope to see you there. Pikes Peak Studio Tour, 10a – 5p, Saturday, November 14 and Sunday, November 15, 2015. Nard Claar and I are proud to have been juried into this annual artists studio tour. Maps online. Free and open to the public. Drawings for free artwork!!!!! “ROAD TRIPS.” Two person show with Nard Claar at Soirée Event Center, (719) 633-8313, 1003 South Tejon Street, Colorado Springs, CO 80903. Aperaçu Reception: Saturday, October 10, 2015 from 5:00 pm to 8:00 pm. Off the Wall Celebration: Saturday, December 26, 2015 from 6:00 pm to 9:00 pm. “Switchback,” Encaustic, watercolor, ink, paper, metal on panel. 12 x 12. Nard Claar and Sheary Clough Suiter Collaboration. SOLD at Soiree Event Center. “CONTAINMENT 4”, Encaustic, 24 x 24. SOLD at Stephan Fine Art, Anchorage, Alaska. Colorado Springs Fine Arts Center Bemis School of Art. “Painting With Encaustic.” 10a – 3p, Saturday, October 17 and/or Sunday October 18, 2015: Suitable for beginning and intermediate level. Register online, call the Bemis office at 719.475.2444, or see the Fall 2015 catalog, page 10. These classes had wait lists last semester, so sign up today. You may take one day or both days for maximum exposure to fab encaustic techniques and tricks. Manitou Art Center Member’s Show. Catch this show and others currently hanging at the MAC. Current show runs through July 31, 2015. 513 Manitou Avenue, Manitou Springs, Colorado. Hours: Monday, Wednesday-Saturday: 11a.m.-7p.m. Sunday: 11a.m.-5p.m. Tuesday: Closed. Phone 719-685-1861. Below The Horizon 2, Encaustic, 12 x 6 Available at MAC. I’m pleased to announce that my encaustic painting, “Unleashed” will be published in the lovely literary journal “Whitefish Review,” Issue #17 Summer 2015, June release date. The theme for this issue is “Mythic Beasts & Monsters” – See the painting in person at 45 Degree Gallery in Old Colorado City, Colorado Springs. “Cirque: A Literary Journal for the North Pacific Rim.” Check out this new issue (Vol. 6 No. 1) of an excellent literary journal which includes some of my encaustic painting artwork and please buy a copy for yourself and one as a gift for another. Preview online images of my paintings, pages 12, 15, 22, 25, and 111. CATTAILS NO. 4, Encaustic, 6 x 12. SOLD at Stephan Fine Arts, Anchorage, Alaska. “Vessel Series: Inspiration,” Encaustic and Mixed Media, 18 x 24. 11th Annual Roll Bike Art Festival. June 5 – September 11, 2015. Opening Reception: Friday, June 5, 5, ­8 PM www.rollbikeart.com Presented by Smokebrush.org at the Trestle Building, 219 W. Colorado Blvd., Suite 210, Colorado Springs, Colorado. PUZZLE NO. 1, Encaustic and Mixed Media, 24 x 21 (triptych) Available at MAC. “WITHOUT KNOWING” New Encaustic Fine Art, a Two person show with Janet Hickok at Stephan Fine Arts Gallery, Hotel Captain Cook, Anchorage, Alaska. First Friday Artist Reception, April 3, 2015, 5:30 – 10p. Preview my new art video! Located downtown at 939 West 5th Ave. Anchorage, Alaska 99501. (907)274-5009 Gallery Hours: Sun-Mon 10-7 | Tues-Sat 10-10. Guest Artist, January. Gallery 113 First Friday Artwalk Artist Reception, January 2, 2015, 5 – 8p. Located in downtown Springs at 113 N. Tejon, Colorado Springs, CO, (719) 634-5299. Open Tuesday through Sunday from 11:00 am to 5:00 pm . PUZZLE NO. 1, Encaustic and Mixed Media, 24 x 21 (triptych). the Modbo SMALL WORKS SHOW 7. 17c East Bijou, Colorado Springs. 719.633.4240. I have three small (duh), priced-to-sell encaustic paintings in this exhibition of over 400 PIECES OF ORIGINAL LOCAL ART. Show runs through January 9, 2015. “Scenes That Make You Go Ahhh!” Gold Hill Mesa Community Center, Opening Reception, First Friday, May 2, 2014, 5 – 9p. 142 S. Raven Mine Drive, Colorado Springs, Colorado. I’ve completed four brand new encaustic paintings, part of the “Would You Like To Swing On A Star” series. Show runs through the holidays, so stop by the Community Center anytime. Let me know you saw this on my web site and receive 25% off! Colorado Springs Fine Arts Center Bemis School of Art. “Painting With Encaustic.” 10a – 3p, Saturday, January 31 and/or Sunday February 1, 2014: Suitable for beginning and intermediate level. Register online or see the Winter/Spring 2015 catalog, page 9. These classes had wait lists last semester, and I will not be offering any summer 2015 classes, so sign up now. You may take one day or both days for maximum exposure to fab encaustic techniques and tricks. Update: BOTH CLASSES WERE FUN AND FULL! Solo Art Exhibition Awardee, Pikes Peak Library District, Colorado Springs Penrose Library, 20 N. Cascade Ave.
FIRST FRIDAY DOWNTOWN COLORADO CITY ART WALK. the Modbo SMALL WORKS SHOW 7. Opening Reception December 5, 2014, 5:30p – midnight. 17c East Bijou, Colorado Springs. 719.633.4240. I have three small (duh), priced-to-sell encaustic paintings in this exhibition of over 400 PIECES OF ORIGINAL LOCAL ART, just in time for the holiday gift giving season. Show runs through January 9, 2015. 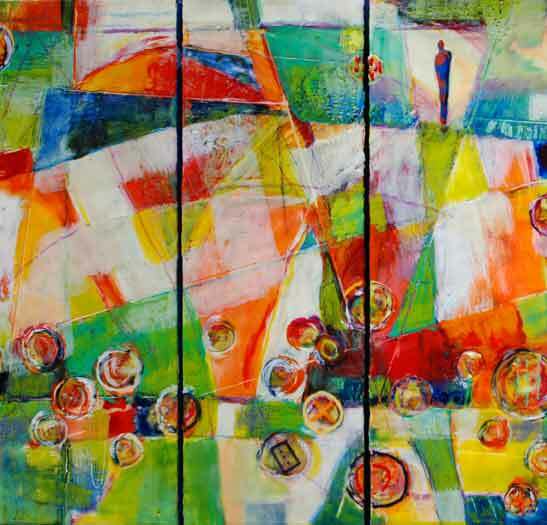 ENCAUSTIC PAINTING DEMONSTRATION at 45 Degree Gallery, Saturday, December 20, 2014, 1p – 4p. Located in historic Old Colorado City at 2528-B W Colorado Ave, 719.434.1214. Painting With Encaustic Demonstration, 45 Degree Gallery, Old Colorado City. FEATURED ARTIST with Nard Claar, November 7th, First Friday Art Walk, Artist Reception, 5 – 8p, at 45 Degree Gallery. New encaustic fine art in historic Old Colorado City. Located at 2528 B W Colorado Ave,Colorado Springs, CO 80904. 719-434-1214. Solo Art Exhibition, Pikes Peak Library District, Colorado Springs East Library, 5550 N. Union Blvd..
“Cirque: A Literary Journal for the North Pacific Rim.” Check out this new issue (Vol. 5 No. 2) of an excellent literary journal which includes some of my encaustic painting artwork and please buy a copy for yourself and one as a gift for another. Preview online images of my paintings, all of which are currently available at either Stephan Fine Arts in Anchorage (pages 12, 35, 66) or Attic Gallery in Portland, Oregon (pages 60, 76). “DRESSED FOR THE DESTINATION,” Original Artwork: Encaustic, Ink, on Japanese Paper. Colorado Springs Bike Locker, Located at the southeast corner off 1-25 at exit 140, Tejon St. Commissioned by the City of Colorado Springs, Public Works Transit Services Division, 24 x 60. “EMERGENTS …in the process of coming into being…something unexpected surfaces.” A Two-person Fine Art Exhibition with Nard Claar at the Manitou Art Center, Hagnauer Gallery, 513 Manitou Avenue, Manitou Springs, Colorado. Opening reception, Third Friday, Artist Reception, 5 – 9p, September 19, 2014. Show runs through October 11, 2014. Come out and see what has “emerged” with my new paper + encaustic explorations. Bemis Faculty Art Exhibition, presented by Pikes Peak Library District. Location: the new Library 21c, located at 1175 Chapel Hills Drive, Colorado Springs. Public Reception, Tuesday, September 9, 2014, 5 – 7p. Exhibition runs September 6 – October 31, 2014. If you haven’t been to the new library, it is a show piece venue, be sure to “check it out” next time you are near the Chapel Hills Mall area. Encaustic and Mixed Media on Panel, 24 X 42. Available at Bemis Faculty Exhibition, Library 21c, Colorado Springs. Pikes Peak Studio Tour, 10a – 5p, Saturday, September 20 and Sunday, September 21, 2014. Nard Claar and I are proud to have been juried into this annual artist’s studio tour, featuring twenty artists in thirteen locations. Maps online. 10th Annual Roll Bike Art Festival. June 20 – Aug 12, 2014. www.rollbikeart.com Presented by Smokebrush.org at the Manitou Arts Center, 515 Manitou Avenue, Manitou Springs. Two-person Fine Art Exhibition with Nard Claar, at the Rock Springs Community Fine Arts Center, 400 C Street, Rock Springs,Wyoming, 307.362.6212. Opening reception, Thursday, May 29, 2014, 5 – 7p. Encaustic Painting Demo during the artist reception. The demo painting will be available for purchase to opening attendees only! Show runs through June 21, 2014. Manitou Art Center Member’s Show. Catch this show and others currently hanging at the MAC. Current show runs through June 2nd. New work starting June 6th. 513 Manitou Avenue, Manitou Springs, Colorado. Hours: Monday, Wednesday-Saturday: 11a.m.-7p.m. Sunday: 11a.m.-5p.m. Tuesday: Closed. Phone 719-685-1861. APRIL FEATURED ARTIST at Colorado Expressions, 122 E. Kiowa Street, Colorado Springs, 719.258.9168. First Friday Downtown Art Walk and Artist Reception, April 4, 2014, 5 – 8p. Exhibition runs through April 30th. TASTE OF OLD COLORADO CITY, Fundraiser for Bancroft Park. Come bid on a piece of encaustic fine art which I will create during the afternoon of Sunday April 27th, 2014, from 1 – 4p. Taste of OCC is a festival of food, drinks, music, and art celebrating the West side. This incredible event is organized by the Old Colorado City Foundation (501c3) whose mission is to raise funds for improvements in Old Colorado City along the avenue. All proceeds from the sale of my painting will go to the Old Colorado City Foundation. Purchase your Taste of OCC tickets. Solo Exhibition, City Administration Building (CAB), Colorado Springs, Colorado. Artist Reception, First Friday, January 3rd, 2014, 4 – 6p, 30 S. Nevada, on the corner of Colorado and Nevada. Come out and see how I manage to fill a 38 foot long wall with encaustic artwork from five series painted over the last two years at my first Colorado Solo Exhibition! Exhibition runs through March 26, 2014. Manitou Art Center Member’s Show. Catch this show and others currently hanging at the MAC at the upcoming Third Friday Artwalk on Friday, February 21. Opening at 5:30. Show runs through March 31st. 513 Manitou Avenue, Manitou Springs, Colorado. Phone 719-685-1861 for hours. 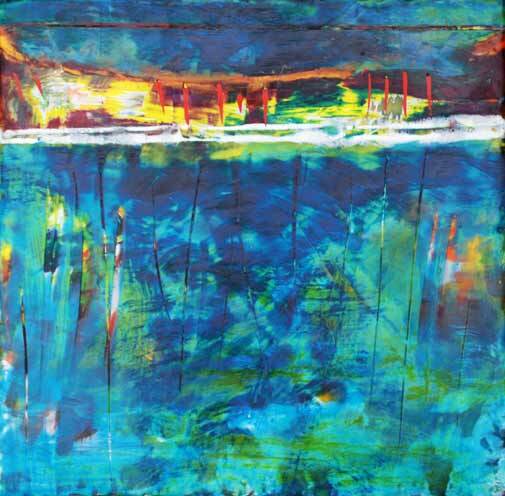 Colorado Springs: Bemis School of Art, 10a – 3p, Saturday, February 1 and/or Sunday February 2, 2014: “Painting With Encaustic.” Suitable for beginning and intermediate level. Old Colorado Studio and Gallery (Old Colorado City/West Colorado Springs) : Please email for current class schedule. Suitable for beginning and intermediate level. Bemis Instructors Holiday Art Sale, Friday, December 6, 4 – 8p, Saturday, December 7, 9a – 5p, and Sunday, December 8, 10a – 3p. Location: 818 Pelham Pl, Colorado Springs, Colorado. Encaustic paintings for sale at $285 each. Free color postcard of one of three of my encaustic paintings, just for attending the event! Manitou Art Center’s 25th Anniversary Show. Opens Friday, December 6, 2013. All five galleries will feature works by past and present artists who have exhibited at the MAC over the past 25 years, including Rockey and Rodney Woods. 513 Manitou Avenue, Manitou Springs, Colorado. Show runs through January 12, 2014. Phone 719-685-1861 for hours. Mad Greens, Denver Art Museum location, 1200 Acoma St. Two Person Show, paintings by Nard Claar and Sheary Clough Suiter. Show runs through December 5, 2013. On display are three paintings from my recent series, Architextural Abstractions. COLORS OF CHANGE Art Exhibition presented by Manitou Springs Arts Council at Coutura Design Inspirations, 6380 Corporate Centre Circle, Colorado Springs, CO. Opening Reception: this Saturday, October 19th, 4:30 – 8p. Free Refreshments, open to the public, family friendly. Show runs through December 31st. I’ve also completed two portrait commissions in encaustic this summer, goodness what a challenge to create facial features with molten wax. Old Colorado Studio and Gallery (Old Colorado City/West Colorado Springs) : Sunday, November 17, 10a – 3p, Suitable for beginning and intermediate level. Santa Fe: EncaustiCon, Two Day Post-Con Workshop, Monday and Tuesday, November 4 and 5, “Discovering Your Personal Iconography.” Suitable for experienced encaustic painters. “The Faces of Pikes Peak,” Exhibition at Academy Frame Company, 7620 N. Academy Blvd. Colorado Springs. Through October 31, 2013. EncaustiCon 2013, October 31 – November 3, Santa Fe, NM. I will be presenting a talk during the conference: “Untethered: An Encaustic Artist on the Road.” Email if you’d like more info on my presentation or the conference. Featured Artist: New Work by Sheary Clough Suiter, Fare Bella, 16 Ruxton Avenue, Manitou Springs, Colorado. Featuring the large multi-panel encaustic paintings from the Architextural Abstractions series. Artist Reception, Third Friday, August 16, 5 – 9p. I will have a painting with encaustic demo at the gallery during the opening, as well. Online Preview. BAC (Business of Art Center), 513 Manitou Avenue, Manitou Springs, CO. Atrium Exhibition, April 7, 2012 – June 4, 2013. New Work in Encaustic by Sheary Clough Suiter and Janet C Hickok. Stephan Fine Arts Gallery, Hotel Captain Cook, Anchorage, AK. First Friday Artist Reception, June 7, 5:30 – 8p. Please all my Anchorage friends come to the opening, can’t wait to see you. Show runs through June 21, 2013. BAC (Business of Art Center), 513 Manitou Avenue, Manitou Springs, CO. Atrium Exhibition, April 7, 2012 – June 4, 2013. I have three paintings on display. Stop by this downtown Colorado Springs upscale Barber Shop, SHEARS , 334 N. Nevada, and check out new paintings by Nard Claar and myself! BAC (Business of Art Center), 513 Manitou Avenue, Manitou Springs, CO. Atrium Exhibition, February 5, 2012 – April 5, 2013. 818 Pelham Place, Colorado Springs. Fri Nov 30, 4 – 8p, Sat Dec 1, 9a – 5p, Sun Dec 2, 10a – 3p. Roll 2012 “Full Circle,” August 3 – October 20, 2012. Marmalade at Smokebrush, 219 W. Colorado Avenue, Colorado Springs. Attic Gallery, 206 SW First Avenue, Portland, Oregon. New work from the Navigator series, part of a three person invitational all encaustic exhibition. Tyler Marchus, Karl Kaiser, and myself. First Thursday Opening Wine Reception, July 5, 6-9 PM. Music by James Fenwick: Classical Guitar. Exhibit runs through July 28, 2012. Unfortunately, this will be the first Attic Gallery opening of mine that I’ll miss….I’ll be headed to Jasper, Canada, to begin a 3 week bike tour, but please don’t let that hold you back from checking out what I expect to be an awesome array of fine art encaustic paintings. Stephan Fine Arts, 939 West Fifth Avenue, Anchorage, Alaska. Please stop by the Hotel Captain Cook and check out the three 16 x 20 paintings that are my latest joy….so new that I don’t have a series name for them, but the painting titles are take-off’s from a book my daughter Lauren read last month, Murarami’s “1Q84” and the colors are turquoises and reds . The most exciting part of making these pieces however was the extensive wax carving I got into, to create the image shapes….during my recent visit to Eugene, OR to celebrate my Grandma Lulu’s 100th birthday, I had the opportunity to dive into my Grandpa Art’s history…he was an artist (wood carver extraordinaire!) and a writer and a teacher….all activities that I have received much joy from pursuing without fully realizing the extent to which these passions are direct connections to my heritage. First Friday in Anchorage. AKIEA (Alaska Chapter of International Encaustic Artists) will open their spring show, “Meltdown,” on May 4th at Doriola’s ( 510 W Tudor Rd. ), 5:30 – 8p. I’m sending up two new paintings, but you know how difficult it is to portray the depth of encaustics, so if you’re in Anchorage, I hope you’ll stop by to view in person, along with the many other artworks from our fine group of encaustic artists! New venue for my work in Old Colorado City! If you live in the Springs area, please stop by ENVI, 2605 W. Colorado Avenue, 719 352 7818. Owner Marci Austin has a wonderful boutique and she is showing my new “With Wings” series! I have returned from the winter gulf coast road trip and finally posted some of my plein air “Casita Series” paintings on the blog: Untethered Artists . The easiest way to know when I post again is to “follow”…a one time click at top right of the blog. I’m hitting the road for the winter but we can stay in touch via my new Blog: Untethered Artists. Follow my travels through the Gulf Coast….some art and biking and musings along the way. The easiest way is to “follow”…a one time click at top right of the blog. I’m happy to announce my new representation in Anchorage by Stephan Fine Arts Gallery . Please stop by the Hotel Captain Cook and see my latest encaustic work. I just delivered three paintings from my new series, “Terrestrials,” which will be on display at the First Friday opening December 3rd. And my encaustic work is also now represented in Ontario, Canada by Something Else. Proprietor Gail Todd offers a wonderful funky array of art, fashion and home decor. Big Picture Discussion Group Exhibition. Opened October 15, 2011 at the Business of Art Center (BAC), 513 Manitou Ave., Manitou Springs, Colorado. ” Pike’s Peak ,” encaustic on panel. Consequential Fusion: Messages In Wax, Art Center Morro Bay, 835 Main Street, Morrow Bay, CA. Juried Exhibition sponsored by International Encaustic Artists. July 7 – August 14, 2011. Opening Reception Sunday, July 10, 3 – 5p. Two paintings from my Archeology Series have been juried into this show. COLLECT/ART: 100 x 100″ International Gallery of Contemporary Art. First Friday opening reception, July 1, 2011, 5:30 – 7:30p. Show runs through July 31. • Features artworks priced at $500 or less, with a special emphasis on $100 works. “WAX SQUARED, 2011” The Alaska Chapter of the International Encaustic Artists (AKIEA) presents a members only show. Nineteen 12 x 12 encaustic paintings. opening at Virtu on First Friday, April 1, 2011. Artist’s Reception from 6 – 9p, Live Music. Located at 400 West 4th Avenue, Anchorage, (4th and D, around the corner from International Gallery of Contemporary Art). (907) 258 4788. Show runs through April 2011. I’m happy to announce Janet Hickok is the new AK IEA President (Alaska Chapter, International Encaustic Artists). Janet stepping into my former position has made it easy for me to transition to my new board position with IEA on the national level, as the new Chief Officer of Opportunities. Thank you, Janet! 2011 KAKM Public Television Art Showcase Auction Support public television by marking your calendars for the 6th Art Showcase Auction featuring beautiful framed and unframed two-dimensional art, sculpture, photography, pottery, jewelry, Alaska Native Art, fiber art, and much more. These items will be up for bid during the three-day televised event which will be broadcast LIVE on Channel 7 from the KAKM studio in Anchorage on Feb. 10, 11 and 12, 2011. All proceeds benefit public broadcasting in Alaska! See and bid on my encaustic painting Parks Highway Overlook .Friday night Feb 11at 9:30p). To bid, call 550-8484 in Anchorage or 1-800-478-5256 outside Anchorage. “TEXT ME” Middle Way Cafe Second Friday Opening, Feb 11, 2011. Group invitational exhibition, incorporating text in some way – shape- or form. I will have six paintings in this show. Blaine’s Art Supply: January 28, 6 – 8p, Last Friday Art Opening to celebrate the January “Painting A Day” event to benefit “Helping Hand for Nepal,” an Anchorage based charity that gives 100% of their donations to the people of Nepal. Music by Steven Bacon and Kendra Kinsey, plus food and libations to kick off the Jan 28 – Feb 25th Silent Auction for all the “Painting A Day” artworks. Over thirty artists, including myself, participated in the event. Please come out and support a good cause…..bid on my painting “Blaine’s Blooms.” At the store’s new location: 1025 Photo Avenue, Anchorage, 561 5344, now open 7 days a week. “FUSED” Alaska Chapter of International Encaustic Artists (AKIEA) group show at Doriola’s. First Friday opening reception November 5, 2010, 5 – 8p. 510 W. Tudor Rd. #7, Anchorage. Show continues through November. ALL ALASKA JURIED BIENNIAL ART EXHIBITION XXXIII, Anchorage Museum. Show runs to Oct 10, 2010. Juror Michael Darling, the Jon and Mary Shirley Curator of Modern and Contemporary Art Seattle Art Museum. The show will travel to Fairbanks and Juneau in 2011. “Deshka Camp,” has been purchased by the museum for inclusion in their permanent collection. “WAX SQUARED” This Alaska Chapter of the International Encaustic Artists (AKIEA) members exhibition will travel from Anchorage to Homer during the month of October. Opening on First Friday October 1st at Ptarmigan Gallery, reception from 5 – 7p . Located at 471 E. Pioneer Avenue, Homer, Alaska, 907 235 5345. Show runs through November 3rd. International Encaustic Artists (IEA) is a professional artists’ organization seeking to raise the level of excellence in encaustic fine art by providing global information exchange and raising interest and understanding about encaustics in the art world as well as with the general public. More information and membership at www.international-encaustic-artists.org The Alaska Chapter of IEA was established in January 2009. Members enjoy camaraderie, exchange ideas on techniques, exhibitions, and sponsor two group shows annually. Email for more info on becoming a member of our local chapter. ROOM TO BREATHE (2010): New Landscapes in Encaustic , opening at Virtu on First Friday, Aug 6. Artist’s Reception from 6 – 9p. Located at 400 West 4th Avenue, Anchorage, (4th and D, around the corner from International Gallery of Contemporary Art). (907) 258 4788. Show runs through Aug 31, 2010. One of my two encaustic paintings from my Room To Breathe series currently on display at the Anchorage Museum’s All Alaska Juried Exhibition, “Deshka Camp,” has been selected for purchase by the museum for inclusion in their permanent collection. I have also been selected this month to receive a 2010 Alex Combs Artist Award. This annual grant is coordinated via the Bunnell Street Gallery in Homer, Alaska. The funds were awarded based on my work in encaustics and provided me with the means to advanced my expertise in the field of encaustic painting through participation in the Fourth National Encaustic Conference, Beverly, MA, June 11 – 16, 2010. Attic Gallery, Portland, Oregon. New encaustic paintings in the “Man Alone” series. First Thursday Artist Reception, June 3, 2010, 6 – 9p, music by Mary Flower, Acoustic Fingerstyle Blues Guitarist. Show runs through June 28. 5:30 pm – 8:30 pm. Tickets are $50 per person / $100 per family. The annual garden fair runs Sat and Sun, 6/26 and 6/27, but the paintings will only be available at the Gala on Thurs. evening. ALL ALASKA JURIED BIENNIAL ART EXHIBITION XXXIII, Anchorage Museum. First Friday, June 4, 6 – 9p, Free admission, 6 – 9p with live music by Alaska singer-songwriter Jared Woods and jazz musician Melissa Bledsoe Fisher. Take a look at my encaustic paintings: Room To Breathe and Deshka Camp. Show runs to Oct 10, 2010. Juror Michael Darling, the Jon and Mary Shirley Curator of Modern and Contemporary Art Seattle Art Museum. The show will travel to Fairbanks and Juneau in 2011. ALL ALASKA JURIED BIENNIAL ART EXHIBITION XXXIII, Anchorage Museum, May 22 – Oct 10, 2010. Juror Michael Darling, the Jon and Mary Shirley Curator of Modern and Contemporary Art Seattle Art Museum. Two of my encaustic paintings have been selected: Room To Breathe and Deshka Camp. The show will travel to Fairbanks and Juneau in 2011. “WAX SQUARED” The Alaska Chapter of the International Encaustic Artists (AKIEA) presents a members only show. Twenty two artists……….. twenty two 12 x 12 encaustic paintings. o pening at Virtu on First Friday, May 7. Artist’s Reception from 6 – 9p, Live Music by “In The Belfry.” Located at 400 West 4th Avenue, Anchorage, (4th and D, around the corner from International Gallery of Contemporary Art). (907) 258 4788. Show runs through May 31, 2010. “COLLECT/ART: 100 x 100” International Gallery of Contemporary Art. First Friday opening reception, May 7, 2010, 5:30 – 7:30p. Show runs through May 31. My new series, “ELEMENTALS,” will make its debut! Encaustics you are encouraged to pick up, hold, caress, stack………… and re-stack. I have been selected as a Featured Artist for the 24th Annual Anchorage Museum Gala 2010. Saturday, April 10, 5:30p – 11p, at the new Dena’ina Civic and Convention Center, call 343 6179 for advance tickets. Available for bidding at the 24th Annual Anchorage Museum Gala 2010 Live Auction. Update: SOLD @ auction for $1500. Support public television by marking your calendars for the 5th Art Showcase Auction featuring beautiful framed and unframed two-dimensional art, sculpture, photography, pottery, jewelry, Alaska Native Art, fiber art, and much more. These items will be up for bid during the three-day televised event which will be broadcast LIVE on Channel 7 from the KAKM studio in Anchorage on Feb. 12, 13 and 14. All proceeds benefit public broadcasting in Alaska! See and bid on my encaustic painting Chutes and Ladders (item number 2043…..Friday night Feb 12 at 9:30p). To bid, call 550-8484 in Anchorage or 1-800-478-5256 outside Anchorage. First Friday at Panache, Feb. 5th, 6 – 8p (or later!?….) : Celebrating the salon’s new location at 300 E Dimond Blvd (Pink Mall/Fed Ex/Kinko’s). Featuring my paintings, both large and small format acrylics on canvas and encaustics on panel, as well as jewelry artist Kathy Goode’s Good Designs. Stop in on your way home from downtown art walk for champagne and chocolate and Valentine’s Day gifts. Free $50 Salon gift card with painting purchase! 907 563 4678. ANNUAL MEMBER ARTIST EXHIBITION. International Gallery of Contemporary Art, December 4 – 27, 2009. ENCAUSTIC ART EXHIBITION at Doriola’s. This is a group showing of work by members of the Alaska Chapter of International Encaustic Artists (AK IEA). The show will run for the month of November and opens with a First Friday reception on November 6th, 2009, from 5p until 8p or until they kick us all out. Doriola’s is located at 510 West Tudor # 7 between Arctic and C Street (just west of Cattle Company and Applebee’s, on the south side of Tudor in the strip mall next to the double Asian restaurants) 907 375 0494. Mon – Fri 5a – 4p, Sat. 6a – 3p, Closed Sundays. “FOOD,” a group show invitational curated by Hal Gage. First Friday opening, November 6th, 2009, Mixx Grill at Inlet Towers, Anchorage. Continues through Feb 3, 2010. “SHADOWS AND FOG,” a three person invitational curated by K N Goodrich, featuring artists Sheary Clough Suiter, Carol Lambert and Zhanna Lukyanova. Opening reception, November 20, 2009, 5-7pm at Out North, 3800 DeBarr, Anchorage. This “Third Friday Opening” coincides with other east-side art space openings. The exhibit will run through December 13, 2009. Mixed Media Group Invitational, Picture Alaska Art Gallery, Homer, Alaska. October 2 First Friday opening reception 5 – 7:30p. Virtu’s Annual “Pink” Invitational Show, in support of women undergoing cancer treatment via Providence Cancer Center Patient Navigation Program. Participating Artists’ Reception, First Friday, Oct 2, 6 – 9p. Located at 400 West 4th Avenue, Anchorage, (4th and D, around the corner from International Gallery of Contemporary Art). (907) 258 4788. Show runs through October 31st, 2009.
INTERNATIONAL ENCAUSTIC ARTISTS ANNUAL RETREAT, Carmel, CA, Oct 1 – 4, 2009. Yippee, I’m traveling to California to enjoy the camaraderie and networking opportunities with nationally recognized encaustic artists and gallery representatives. Not to mention, some sunshine!!! I expect to return bursting with new information to share with the local IEA chapter, as well as with my workshop students. NEW EXPLORATIONS IN ENCAUSTICS: International Gallery of Contemporary Art, Guest Room. Group show with Lesley Harrison, Irina Danielson, and Yuliya Helgesen-Thompson. Opening Reception, First Friday Sept. 4, 5:30 – 7:30p. 427 D Street, Anchorage. Show runs through Sept. 27, 2009. “My Dream of You,” Encaustic on driftwood. ROOM TO BREATHE: Landscapes in Encaustic , opening at Virtu on First Friday, Aug 7. Artist’s Reception from 6 – 9p. Located at 400 West 4th Avenue, Anchorage, (4th and D, around the corner from International Gallery of Contemporary Art). (907) 258 4788. Show runs through Aug 31, 2009. 5th Annual Roll Bike Juried Exhibition and Festival, opening at The Warehouse, 25 W Cimarron, Colorado Springs, CO. First Friday opening Aug 7 with music by Mirage and Kathryn Zimmann. Show runs through Aug 28, 2009.